4open has published its first article in the field of physics. The article – “Various damage mechanisms in carbon and silicon materials under femtosecond x-ray irradiation” by Nikita Medvedev et al, is free to read on the 4open website. The article presents research results on damage mechanisms in materials irradiated with fem-tosecond free-electron-laser (FEL) pulses. 4open is currently encouraging submissions in the multi- and inter-disciplinary fields of natural sciences, medicine and technology, including material sciences and engineering. Paris, 26th June 2018: EDP Sciences reports another robust performance in the 2017 Journal Citation Reports® (JCR) published by Clarivate Analytics, 2018. Over half of the 21 EDP Sciences journals indexed show an increase in their Impact Factor, with 47% increasing by over 10%. Astronomy & Astrophysics increases its Impact Factor by 11% to 5.565, having continued to climb for the past three years. The journal remains in the top 10 in the Astronomy and Astrophysics category, and a leading source of original research, rated 10th out of 66 journals in the discipline. Parasite maintains a strong Impact Factor of 2.069. The journal is ranked 18th out of 37 journals in the Parasitology category. International Journal of Limnology and Knowledge and Management of Aquatic Ecosystems both maintained a 5-year Impact Factor of above 1 (1.228 and 1.820 respectively). Knowledge and Management of Aquatic Ecosystems saw an Impact Factor increase of 25% when compared with last year. “EDP Sciences is delighted to see the impact that our journals continue to make in the respective disciplines. Titles are growing and being cited consistently, with a cumulative increase in Impact Factor of 5% in the past year” remarked Agnès Henri, Managing Director at EDP Sciences. “EDP Sciences will continue to promote scientific excellence, supported by the hard work of the editorial teams and the contributing authors, who ensure the performance of our journals every year. EDP Sciences is a not-for-profit publisher, established in 1920, belonging to learned societies with a mission to participate in the dissemination of important research that accelerates scientific progress and cross-fertilisation of ideas of the society in general. EDP Sciences is located in Paris, London, and Shenzen and publishes over 55 scientific journals in the physical sciences, mathematics, life and environmental sciences, energy, materials and engineering, health and biomedical sciences. It also publishes 20 professional magazines, conference proceedings (www.webofconferences.org) and books. After a scene-setting editorial, and invited commentary on the Open Access and Open Science landscape, 4open has published a letter appraising current aspects of focus in cancer research. Read “Pragmatic cancer approach – time to change?” by Mesut Tez on the 4open website. 4open is also featured in the latest issue of European Biotechnology, where Editor-in-Chief, Prof. Dr. Björn Brücher comments that “4open is a journal both for established teams and young researchers” and seeks “excellence in science. 4open is currently inviting submissions in the multi- and inter-disciplinary fields of natural sciences, technology, and medicine, including material sciences and engineering. 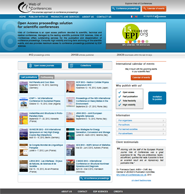 EDP Sciences is pleased to announce that it has joined the Initiative for Open Citations (I4OC). The I4OC is a collaboration between scholarly publishers, researchers, and other interested parties, to promote “the availability of data on citations that are structured, separable, and open”. This project promotes the unrestricted availability of citation data by asking publishers to ensure that references within academic articles are made publicly available. This then allows for references to be distributed without restriction through Crossref’s services, and made available to all. Create a global public web of linked scholarly citation data which will enhance the discoverability of published content. Build new services over the open citation data, for the benefit of all key stakeholder groups: publishers, researchers, funders, academic institutions, and the general public. Create a public citation graph to explore connections between disciplines and the evolution of ideas and new disciplines. To read more about the initiative, the founding organizations, participating publishers, and the progress so far, visit the I4OC website. Surgery and Medical Technologies, an open access journal dedicated to publishing high-quality papers that describe original research and innovation in all areas of medical technologies in relation to surgery. The journal will use EDP’s Liberty APC model for article processing charges, where authors can choose their own fair price to publish a paper in open access including an amount of 0€. Surgery and Medical Technologies will publish research and technology papers reporting on innovation for surgical devices, including surgical instrumentation, innovative biomaterials, tissue engineered devices, and imaging techniques and software used for surgery planning or surgical navigation, and surgical robotic devices. These texts provide the engineering approach as well as clinical implications. Additionally, the journal will also publish review articles and papers dealing with issues such as methodologies for evaluation and quality assessment, ethics, education, safety and clinical outcome, cost and health policy, and broader issues related to impact that surgery and medical technologies have on patient and society. Discover all covered topics here. More information on new publication by EDP Sciences here (PDF). EDP Sciences has announced that it is now publishing the fully Open Access journal, Regenerative Medicine Research. EDP officially took over publication of the journal during spring 2016. The first issue published by EDP Sciences will be opened in the second semester of 2016, publishing the articles newly submitted and accepted since the journal transfer. Regenerative Medicine Research is a peer reviewed international open access journal that publishes research relating to both the fundamental and practical aspects of regenerative medicine, with a particular emphasis on translational research. It will use EDP’s Liberty APC model for article processing charges, where authors can choose their own fair price to publish a paper in Open Access including an amount of 0€. More information on new publication by EDP Sciences here. EDP Sciences and Astronomy & Astrophysics are glad to announce the "4th Scientific Writing for Young Astronomers", which will be held in Puerto Varas, Chile, from 19th to 22th April, 2016. For further information, we invite you to visit our website and to like our Facebook page "Scientific Writing for Young Astronomers". EDP Sciences has recently announced the addition of Altmetric data for Parasite. Altmetric data gives users a more complete picture of how people are engaging with scholarly literature by tracking a variety of sources, including news, social media, bookmarking and peer-review forums, to provide data on the online activity surrounding each research article. Readers can click on the Altmetric badge to view the original mention and explore the news stories, tweets, blogs and more for themselves. This data is important to both authors and readers, helping them understand the wider dissemination of research, and allows them to engage in online conversations they may not have been aware of. 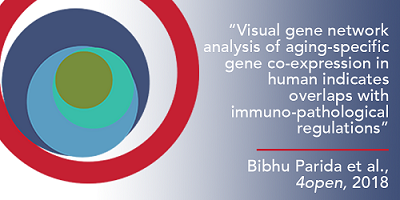 See http://www.altmetric.com for more information. EDP Open, the Open Access imprint from EDP Sciences, is delighted to announce the launch of a fully Open Access Journal EPJ N Nuclear Sciences & Technologies which is edited in partnership with the French Nuclear Energy Society (SFEN). EPJ N will be a fully open access peer reviewed journal and will publish technical papers, technical notes, critical reviews, selected papers from workshop and congress proceedings, computer code abstracts, and letters to the editor in all areas of the peaceful use of nuclear energy, as well as on applications of nuclear particles and radiation. EPJ N is a part of The European Physical Journal (EPJ) which is a series of peer-reviewed journals covering the whole spectrum of physics and related interdisciplinary subjects. EDP Sciences is pleased to announce the release of the 2014 Impact Factor, from Thomson Reuteurs, for the Open Access journal SWSC. It shows slight growth with a 2014 Impact Factor of 2.558 and an Immediacy Index, based on articles published in SWSC in 2014 and cited in 2014 of 0.857 (2013: 0.600). This title received last year its first Impact Factor, and once again this year, it shows how the editorial team did the best by selecting and communicating the most important and valuable scientific information to the broadest possible audience. The 2014 Impact Factors reflect SWSC's success at doing this, and the exceptional authors and referees that they are privileged to work with. The first edition of the journal includes articles from researchers in the UK, Canada, France and Japan. Click here for more information on those articles. EDP Sciences have today released information on the findings and recommendations of a working group into the peer review process. The meeting involved a committee of experts linked to the European Physical Journal (EPJ) including Editors-in-Chief, Associate-Editors, members of the Steering Committee and researchers involved in Scientific and Technical Information. EPJ itself, represents 25 European Physical Societies through its Scientific Advisory Committee. The aim of the workshop held in Paris in May was to consider whether peer review is adapting to present day demands and constraints, and to consider and make recommendations to EPJ and their partners regarding new practices and improvements that could be made to their procedures. EDP Sciences and the French Society of Oral Surgery (SFCO) have announced the transition of Médecine Buccale Chirurgie Buccale from a subscription based journal to full Open Access starting with the first published issue of 2015. All future volumes and issues of the journal will be Open Access under a Creative Commons license 4.0. This transition is driven by the ongoing movement for scientific literature to be Open Access for scientists, policy makers and the general public interested in research, and especially by the growing demands from funding agencies to ensure free access to research they have funded. Simultaneously, access is given to the complete archives of the journal published with EDP Sciences, back to Volume 7, Issue 1. For members of SFCO, the printed version of the journal will continue to be published. We are proud to announce that EDP Sciences and Astronomy & Astrophysics are Gold sponsors of the IAU XXIX General Assembly in Honolulu, Hawaii – August 3-14 2015. We will be attending this meeting to showcase Astronomy & Astrophysics one of the leading journals in the field and hope to see you there. A hui hou*! The E-MRS Spring Meeting is one of the most important events in Europe with over 100 international exhibitors, 33 topical symposia and 3,000 attendees this year. The programme highlight the latest advances in international materials research and key novel applications. EDP Sciences will be present at this meeting, stand #95, to present its Materials Sciences and Engineering journals, books and proceedings. For more information: E-MRS Spring Meeting 2015. EDP Sciences will be attending the UKSG 38th Annual Conference and Exhibition in Glasgow, 30 March-1 April 2015. EDP Sciences are delighted to announce the launch of SICOT-J, to be published on behalf of the International Society of Orthopaedic Surgery and Traumatology (SICOT). SICOT-J will be a fully open access peer reviewed journal covering a broad range of research study types in the entire field of orthopaedics and traumatology. To learn more, or to submit your article visit www.sicot-j.org. On the second day of the Frankfurt Book Fair, EDP Open, the Open Access publishing arm of EDP Sciences, has released the results of a survey to appraise attitudes toward Open Access amongst learned society publishers. The survey was answered by 33 learned societies and the results were further supplemented by a focus group held at the annual UKSG meeting in April 2014. This presentation was focused on the main results of this survey. EDP Sciences is pleased to announce that Journal of Space Weather and Space Climate (SWSC) has received its first impact factor of 2.519 according to the 2013 Journal Citation Report, published by Thomson Reuters. “This Impact Factor is not an achievement. It is a picture in a long process. But it gives us a good idea of our place in the frame: a good one…,” said Jean Litensten, SWSC Editor in Chief. “This is of course firstly due to the great work by all the Associate Editors and the Editorial Office, we are very proud to belong to a team with so many skills and so much enthusiasm, able to construct something as beautiful as a scientific journal." Thomson-Reuters also publishes an Immediacy Index of 0.600 (citations of SWSC articles published in 2013). Launched in 2010, The Journal of Space Weather and Space Climate (SWSC) is an international multi-disciplinary and interdisciplinary peer-reviewed open access, with an author pays model. SWSC publishes papers on all aspects of space weather and space climate from a broad range of scientific and technical fields. 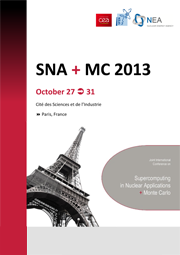 Web of Conferences is pleased to welcome to its platform SNA&MC 2013, the “Joint International Conference on Supercomputing in Nuclear Applications + Monte Carlo”, held in Paris from 27 to 31 October 2013. The ambition of SNA&MC 2013 is to review recent breakthroughs in High Performance Computing (HPC) and in Monte Carlo, as well as in the usage made of them in the very varied fields of nuclear applications. Web of Conferences and EDP Sciences are pleased to announce the launch of ITM Web of Conferences, an open access journal dedicated to the publication of conference proceedings in all areas related to informatics and mathematics. ITM Web of Conferences aims to make conference proceedings visible, citable and widely usable by the scientific community. It offers outstanding services for the publication and dissemination of the contents in order to ensure long-term archiving and maximum exposure of the scientific events. 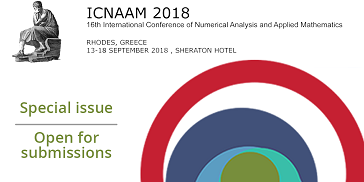 Coverage includes the whole spectrum of pure and applied mathematics, as well as all domains related to informatics such as programming, operating systems, databases, software engineering, web technologies, human-computer interaction, etc. With ITM Web of Conferences, EDP Sciences expands its services for the publication of conference proceedings, and offers conference organizers with a selection of open access journals covering a large spectrum of scientific fields. These journals aim to increase the visibility and enhance the profile of the scientific events, as well as to highlight the work of the authors. EDP Sciences and Web of Conferences are pleased to announce the launch of E3S Web of Conferences, an open-access journal dedicated to the publication of conference proceedings in all areas related to Environment, Energy and Earth Sciences. This journal offers versatile and highly flexible solutions, which aim to make conference proceedings widely usable by the scientific community. Maximum speed of publication and visibility are combined with a maximum of flexibility regarding formats. Web of Conferences and EDP Sciences launched SHS Web of Conferences, an open-access publishing service dedicated to the publication of conference proceedings in all areas of social and human sciences. Maximum speed of publication and visibility are combined with a maximum of flexibility regarding formats. For further information have a look at the website of SHS Web of Conferences.